"Sarah's training and depth of experience as a master printer sets a benchmark for all would-be printers: This exhibition provided an impressive introduction to the work of an expatriate artist whose cultural imagery remains identifiably linked with Australia. Unlike many Australian-made prints, which remain intimate in scale, Sarah Amos's larger works can clearly retain their aesthetic vigour either individually or as a series within the more imposing architectural setting of a major corporate building." 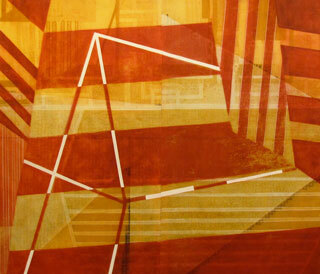 "Sarah Amos is a VT based Australian printmaker currently practicing in the United States. In this new series of work she employs a process of richly layered printmaking punctuated by over painting with vibrant and dynamic pattern. 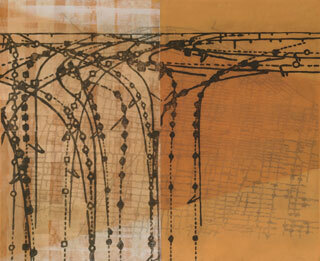 Her prints are created by hand on a large etching press. 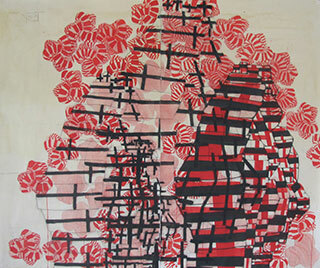 She combines Carborundum Etchings, Monoprints and Collograph plates to make the final printed surface. The successive layers of pattern are laid on often while the surface is still wet. These ground layers create a foundation for the work, with soft, repetitive shapes and quiet colour. The complex and fluid threading of lines, dots and swirls shfifts the spatial language of the print dramatically. The prints are then further embellished with organic, scientific and architectural references in gouache, watercolour, pencil and charcoal ro create a surreal surface where two disparate environments collide." "Sarah Amos' new works on paper offer a uniquely pre-modern glimpse on a post-modern landscape. Amos' genius lies in her talent to translate urban architecture into the organic calligraphy of symbolic aboriginal place-making. Grids suggest a third dimension where for centuries there were only two. Her large pieces are at once poetic and provocative, pretty enough even to ignore the complex history that informs them." "The wavy lines, dots, lace patterns, and architectural and geographic references derive from sources as diverse as Japanese prints, eighteenth century Dutch lace, Victorian floral motifs, textile patterns, aborigial art, Chinese and Japanese furniture, Maori and Pacific Islands sculpture and textiles, African architecture, marine military maps, and tribal masks. With so much layering of content and form, Amos's mural-sized prints embody her search for an identity and become road maps of her experiences real and imagined." Rachel Rosenfield Lafo, Curator DeCordova Museum and Sculpture Park, Lincoln MA.